“Deo gratias anglia. redde pro victoria. “Owre kynge went forth to normandy. with grace and myzt of chyualry. ther god for hym wrouzt mervelusly. Wherfore Engloncle may calle and cry. Deo gratias. “he sette a sege the sothe for to say. To harilu toune with ryal aray. that toune he wan and made a fray. that fraunce shall rywe tyl domesday. Deo gratias. (b.) “Than for a sothe that knyat comely. yn agincourt feld he fauzt manly. Thorw grace of god most myzty. he had bothe the felde and the victory. Deo gratias. “There dukys and erlys lorde and barone. Were taken and slayne and that well done. And sumnie were ladde in to londone. With ioye and merthe and grete renone. Deo gratias. “Now gracious god he saue oure kynge. his peple and alle his wel wyllynge. zef him gode lyfe and gode endynge. That we with merthe mowe sauely synge. Deo gratias. The verse here placed last is evidently the third; this is probably indicated by the letters “a” and “b”in the left margin of the MS. The copies from the Pepysian MS. place it third in order, showing that their exemplar corrected the sequence of the stanzas. The notation of the original is in black diamond-headed notes, with ligatures, etc., as in our version. The use of red notes for triplets is the same as in our MS. The notes which represent the ligatures of the MS. are here connected by slurs. No accidentals have been added; the B flat is indicated in the MS. in two places. The last two crotchets of the third bar from the end must contain a mistake in one of the lower parts. To raise the two crotchets one place, in the middle part, brings the bar into greater conformity with our version, and this is probably the right solution. 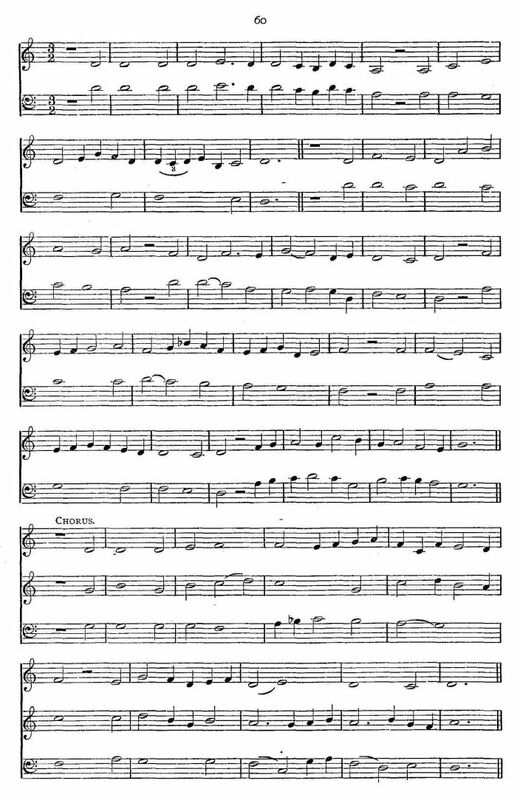 In the versions of Burney, Percy, and J. Stafford Smith, there is a blank in the upper part until the words, “forth to Normandy.” The Oxford original shows that the unisonous beginning, which is so remarkable a feature of the Cambridge version, is correct, and that the two voices sing together throughout. The origin of the omission of the upper part is also clearly shown; for the illuminated capital D is placed, in the Bodleian MS., against the beginning of the lower part only, and thus the transcriber doubtless thought that the line above the part so adorned belonged to the preceding song. The most interesting differences between the two versions are — first, the alteration in bar 17, where the cadence, so characteristic of our whole series of Carols, is replaced by a commoner form in the Oxford version; and second, the first notes of the triphonia, marked as “Chorus”in the Oxford MS. As we have it, the root of the harmony is D; in the Oxford MS. it is G. With these exceptions, the two versions are practically identical. The Oxford version, in its integrity, seems not to have been published in any form, but there are several transcripts of the Pepysian version, or rather reprints of the published transcripts of the Pepysian version, and therefore descendants in the fourth degree from the Oxford original. Among these may be noticed an arrangement, for three voices throughout (excepting in the opening bars), by Morton Latham, Esq., Mus.B. As this arrangement is intended for general performance, the editor has not hesitated to alter the part-writing, but has marked every alteration with asterisks, without, however, indicating the reading of his original. 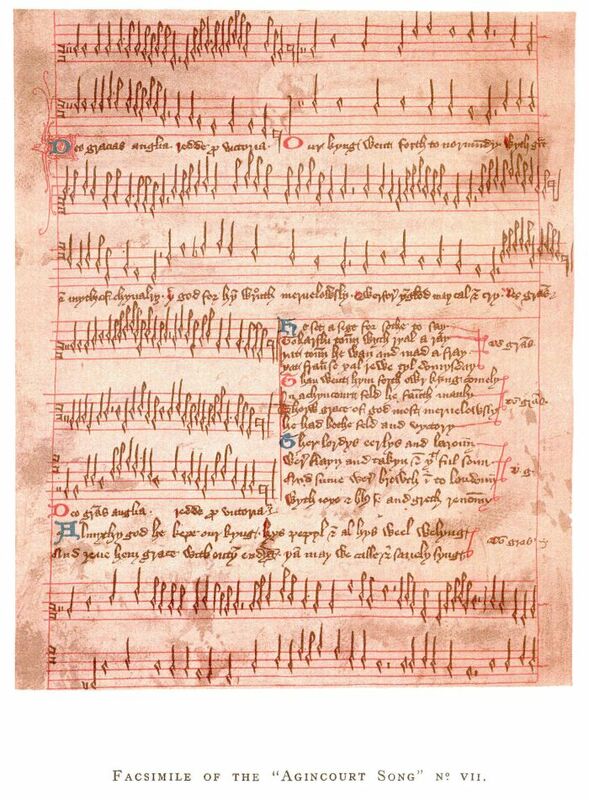 Agincourt Song (from William Chappell, The Ballad Literature and Popular Music of the Olden Time. London: Chappell & Co., 1859), plus the Agincourt Carol (PDF of the sheet music).